Ever since we first went to La Poste and sent a newsletter to our friends (and to their friends, with promises of free wine), we’ve sold and delivered our wine direct to people at home in the UK. Note that the sales margins above are not ’profit’: they have to cover the cost of staff, sales and marketing, premises, distribution and all operating costs for a retailer and, in many cases, those of an agent or distributor too. As you can see, the cost price of the liquid inside the bottle – which includes the grower’s profit - is measly when you spend £5.60. The national average in the UK is £5.68 (according to the WSTA/Nielsen, Sept 2018). This example is for wine shipped and bottled in bulk, and even if the numbers varied a little, only a fraction is spent on the contents. UK duty is fixed at £2.23 (from 1 February 2019) and there's 20% VAT on the wine AND the duty, so the tax element of a cheapish bottle is always substantial - there's 61% tax in a £5 bottle. All things being equal then, you get a lot more wine when you trade up. To complicate matters though, you don't always get what you pay for. 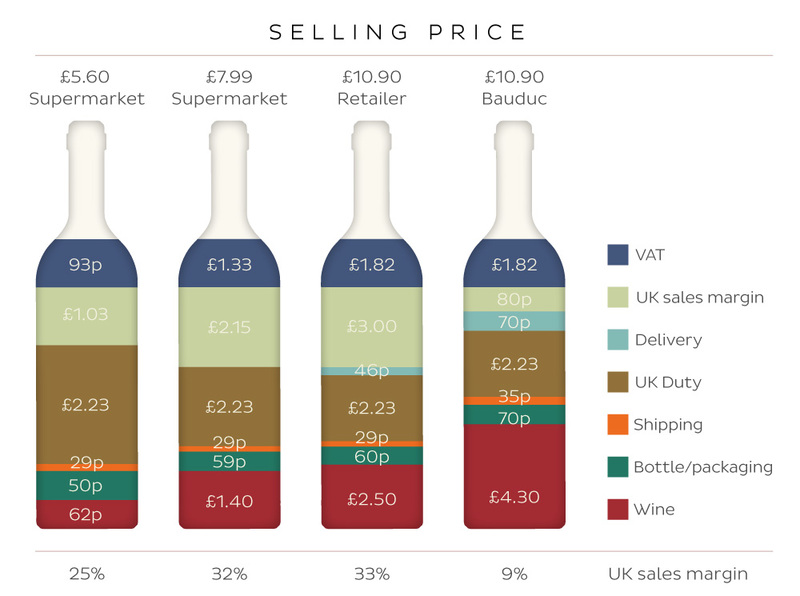 There are so many pseudo offers on wine in the UK, both in store and online, it’s hard to know what the real price should be. Is a £10 bottle really worth that, or is it about to be 'discounted' to £7 - i.e. the real price? When you buy direct from us, you can be sure that a much higher percentage of your money is spent on the wine. It's then up to us to make sure it's good, in the vague hope that you'll come back for more.